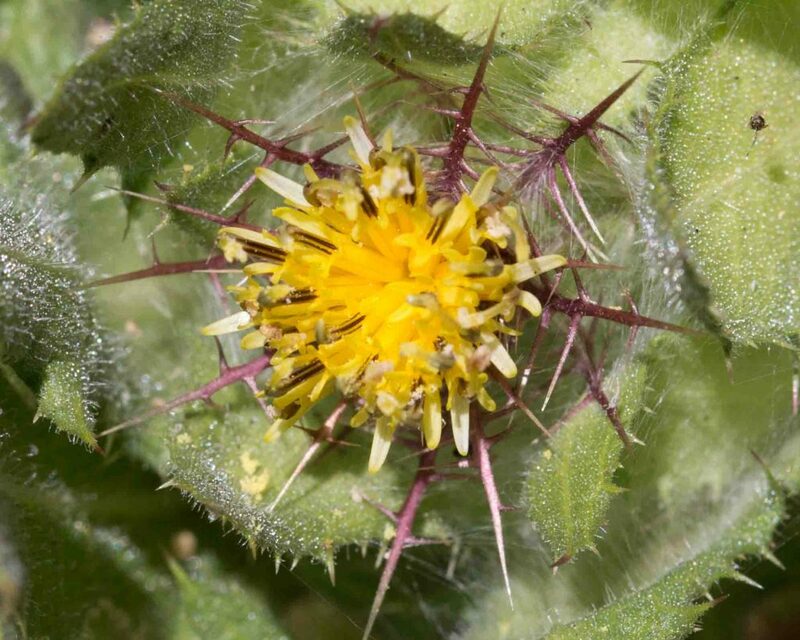 The Sunflower family is a very large family with over 25,000 members. 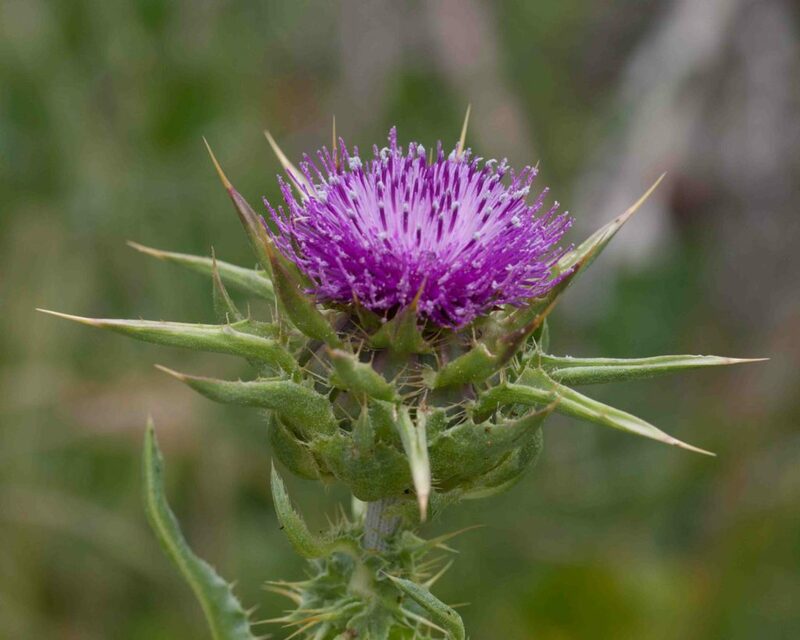 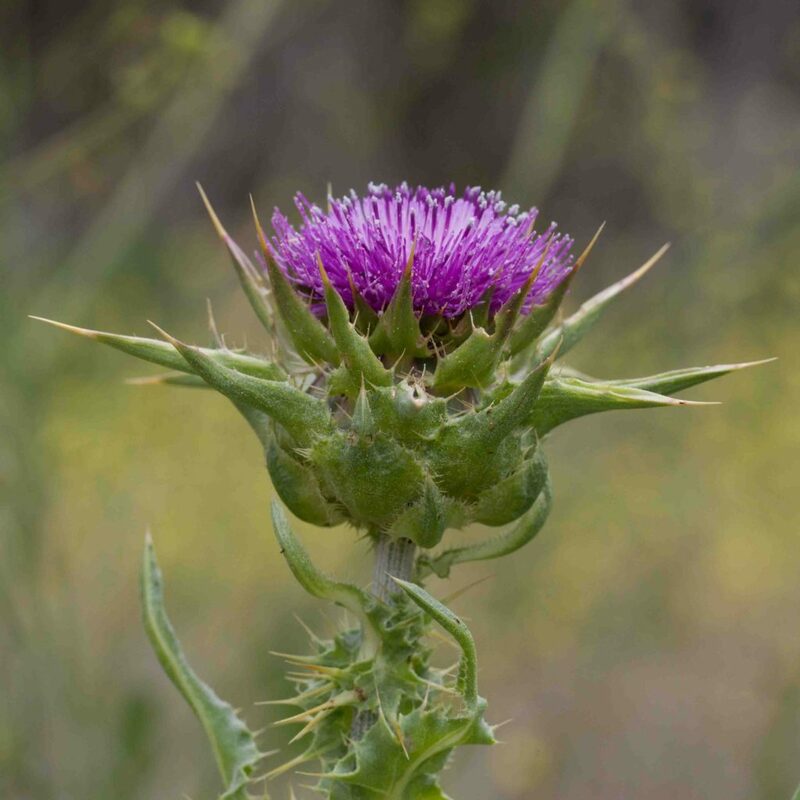 Botanists subdivide the family into a number of tribes of which 14 are represented in Monterey County, one of these, the Heliantheae or Sunflower tribe, being further broken down into subtribes of which 9 are represented in Monterey County.The Cynareae (Thistle tribe) has 8 genera present in California all but one of them (Cirsium) alien and many invasive, including the ones found on this page. 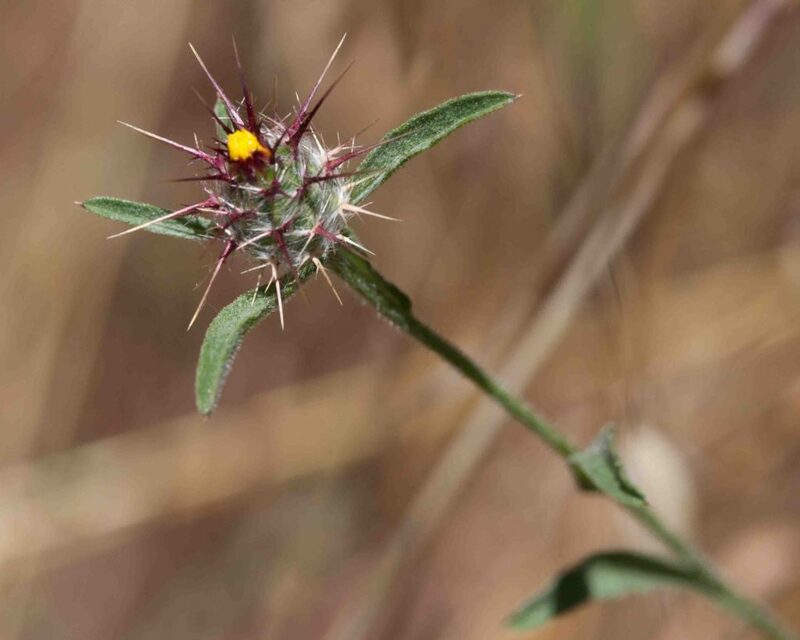 Flower heads are fairly small (10–14 mm across) and in groups of 1–5, typically 3. 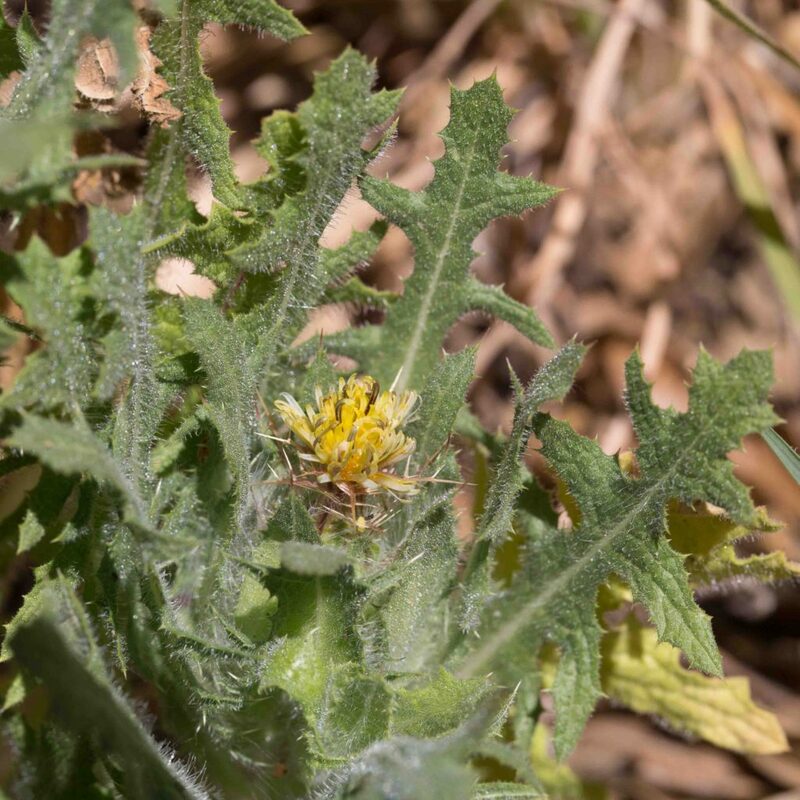 Both leaves and stems are extremely prickly. 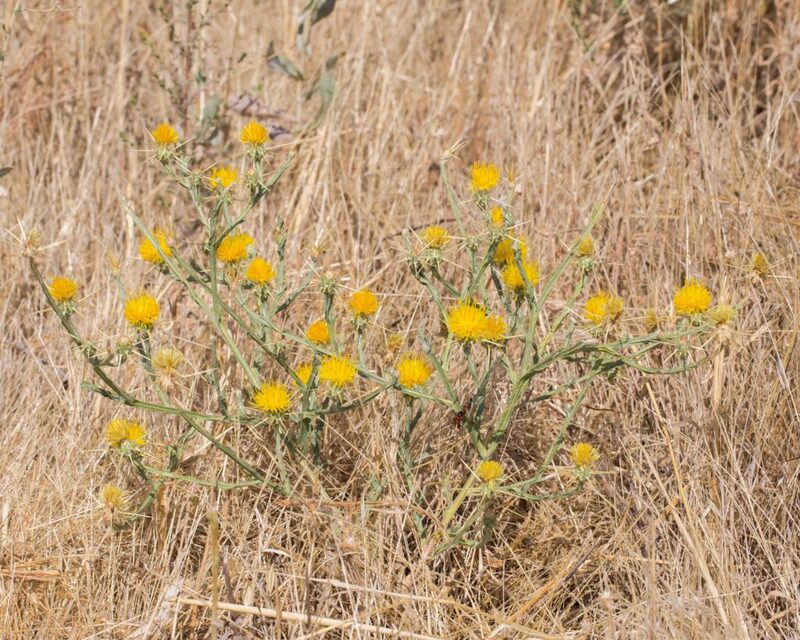 Locally this can be highly invasive and hard to eradicate. 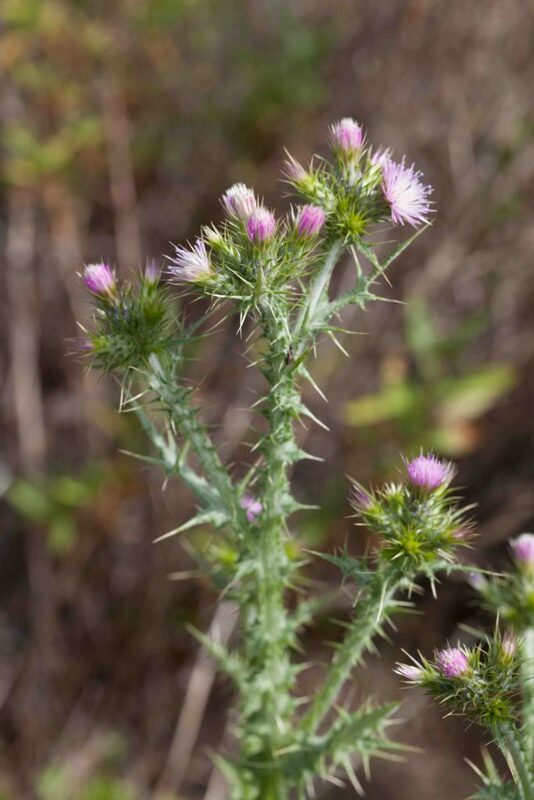 The flowers are similar to those of Italian Thistle (Carduus pycnocephalus) but are a paler shade of pink and are found in groups of 5–20. 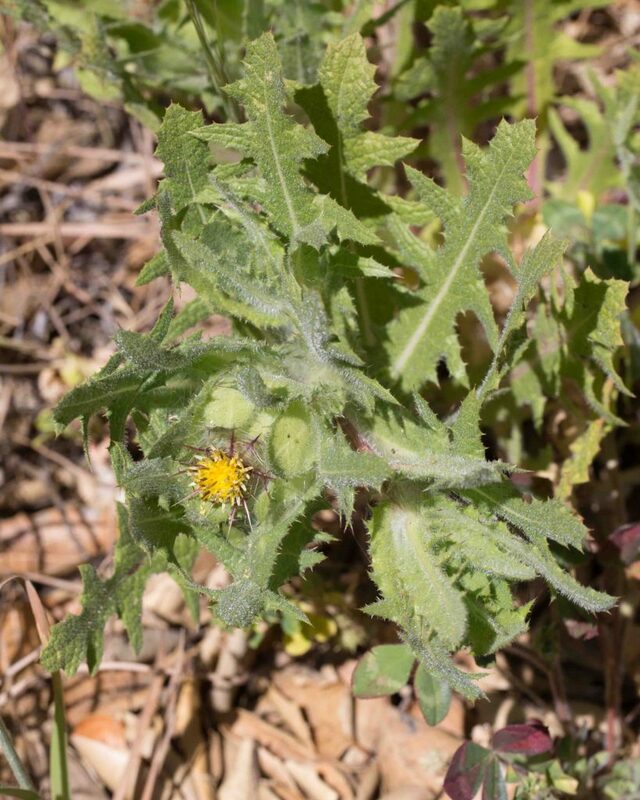 Both leaves and stems are extremely prickly. 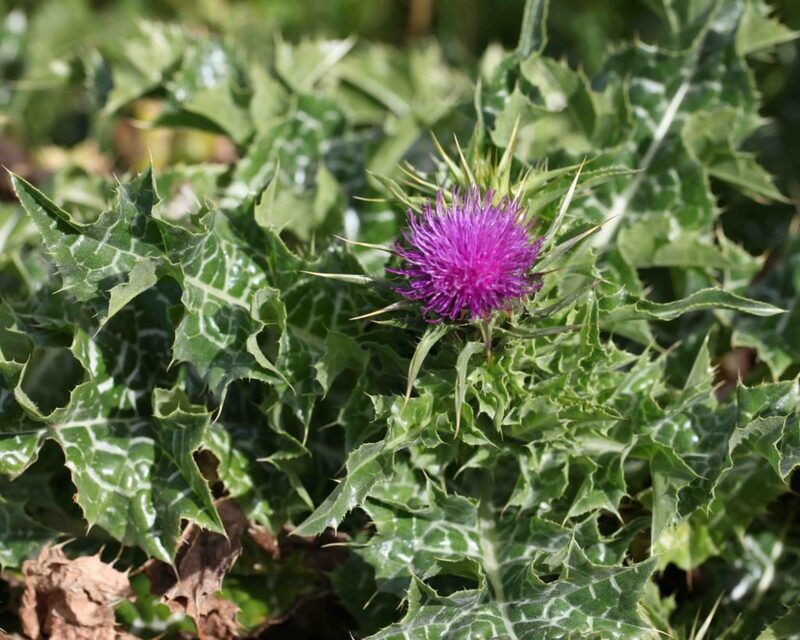 Locally this can be highly invasive and hard to eradicate. 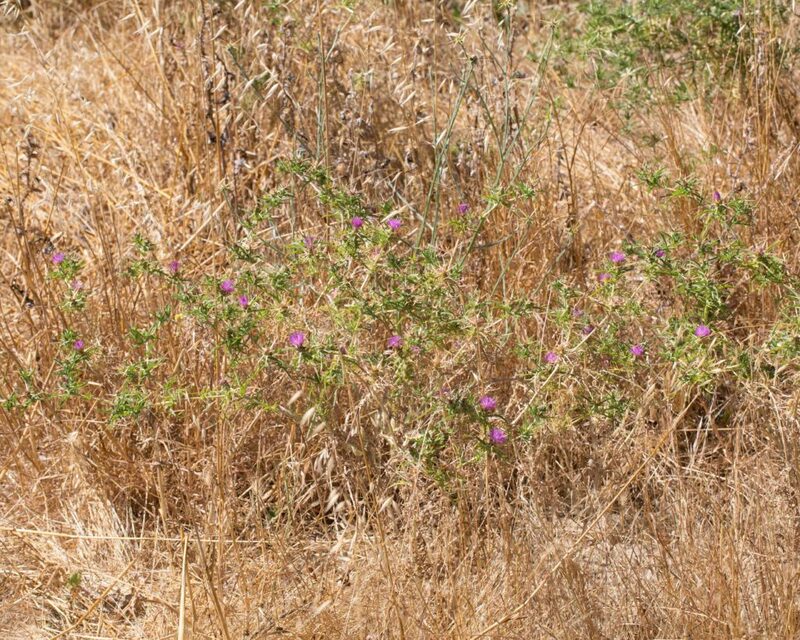 Low growing with sprawling branches rising from the basal leaves. 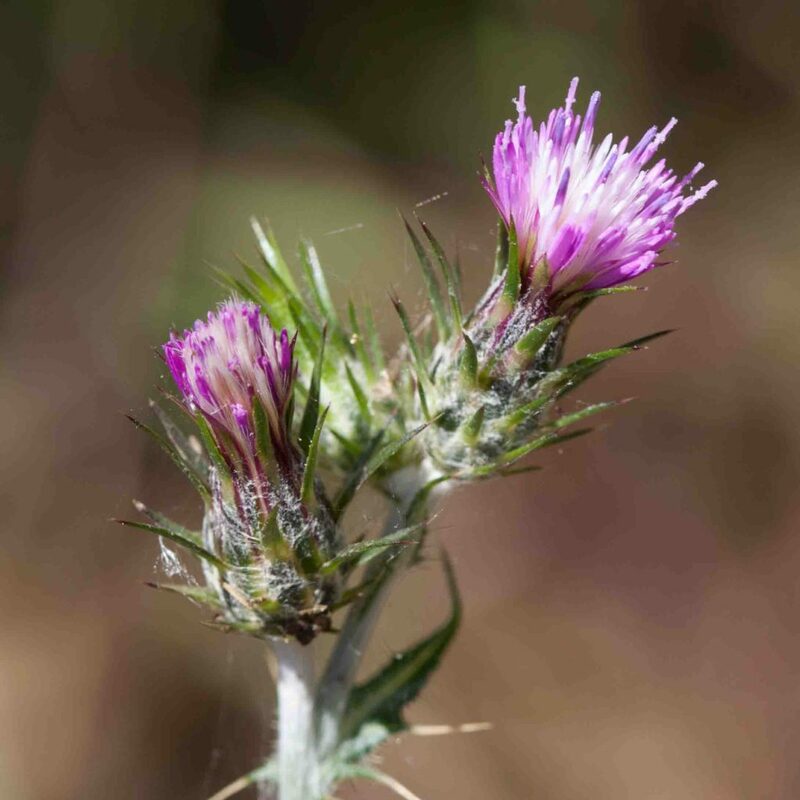 Flower heads are small, sessile or subsessile and subtended by leaf-like bracts. 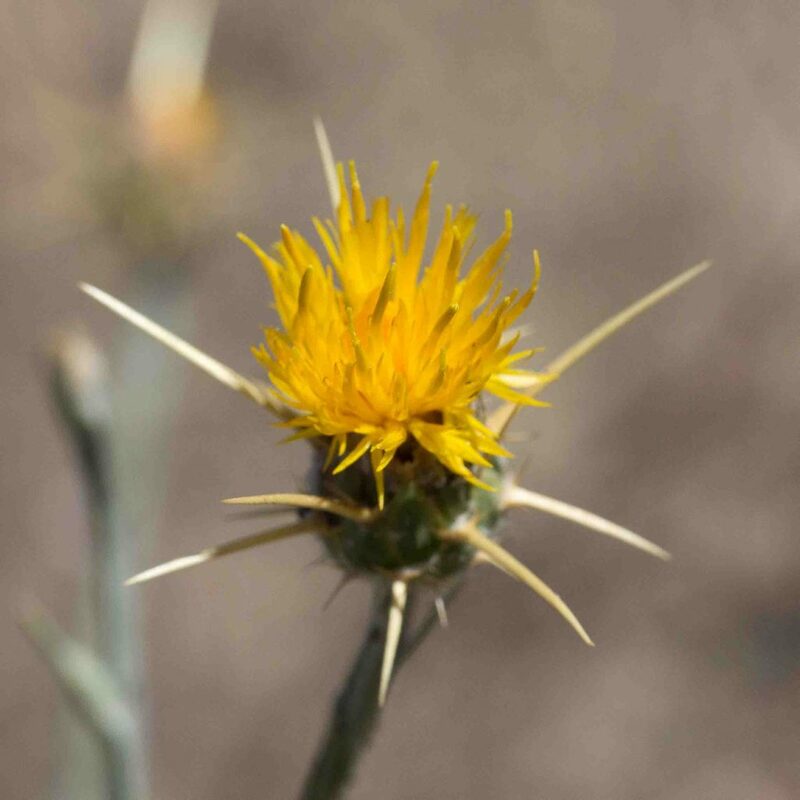 The inner phyllaries are pinnately divided with the divisions having spiny tips. 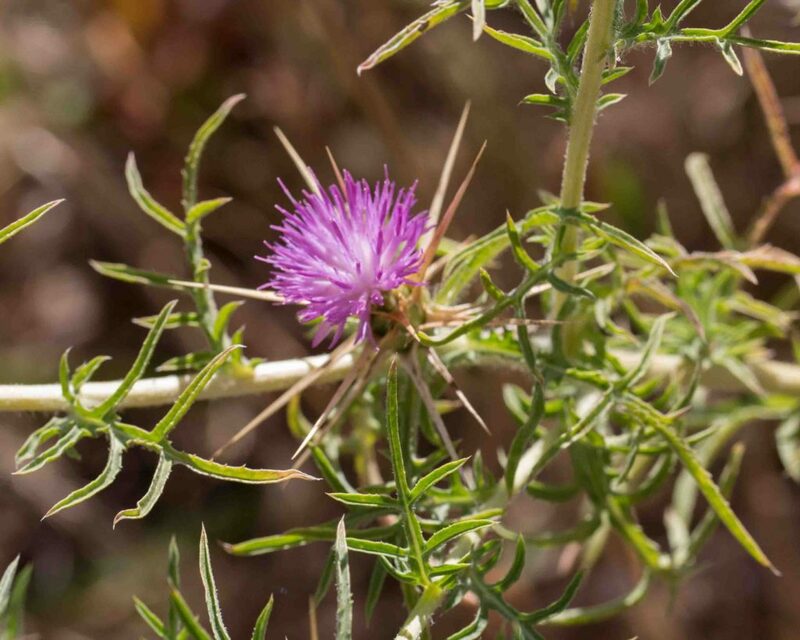 The fruit has a straw-colored pappus with 2 series of unequal bristles. 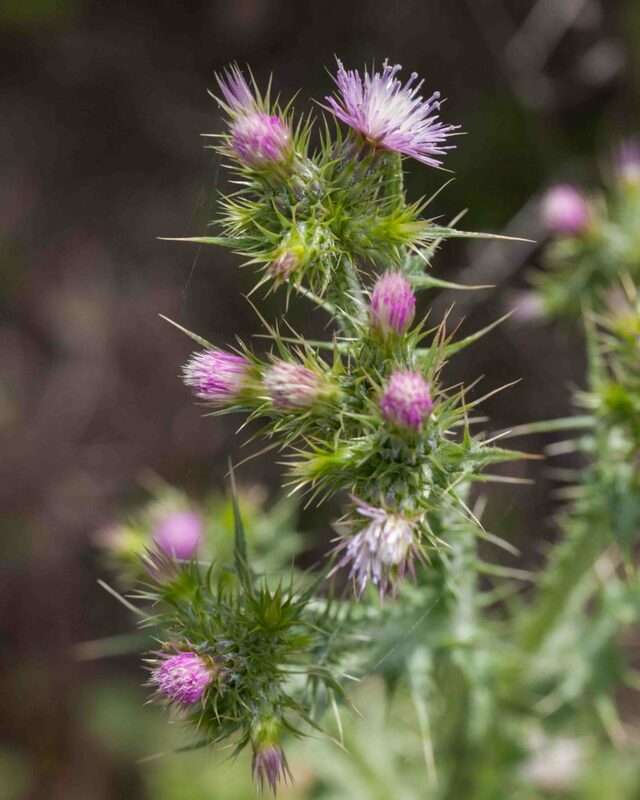 A naturalized garden escapee, this is typically a rich blue but is also found in pink or even white forms. 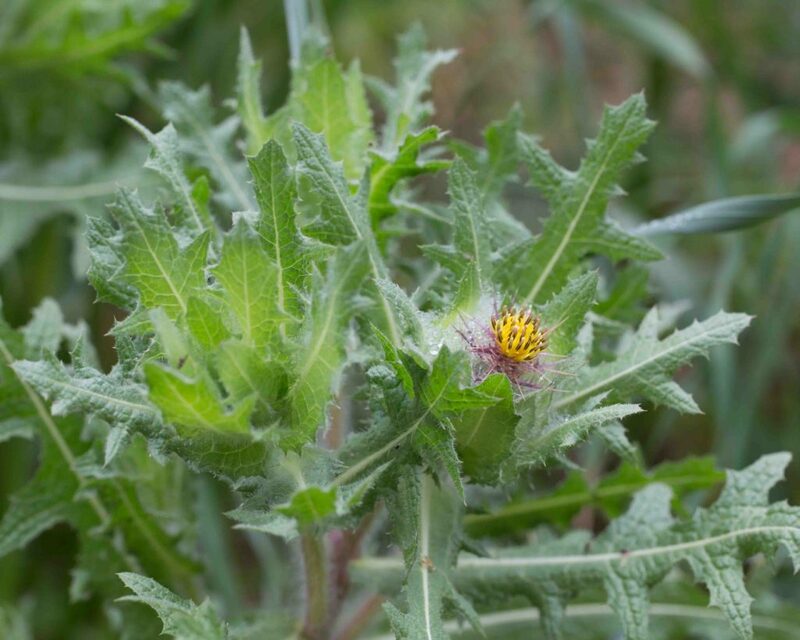 Leaves are more or less loosely gray-tomentose with linear to linear-lanceolate leaf blades with entire margins. 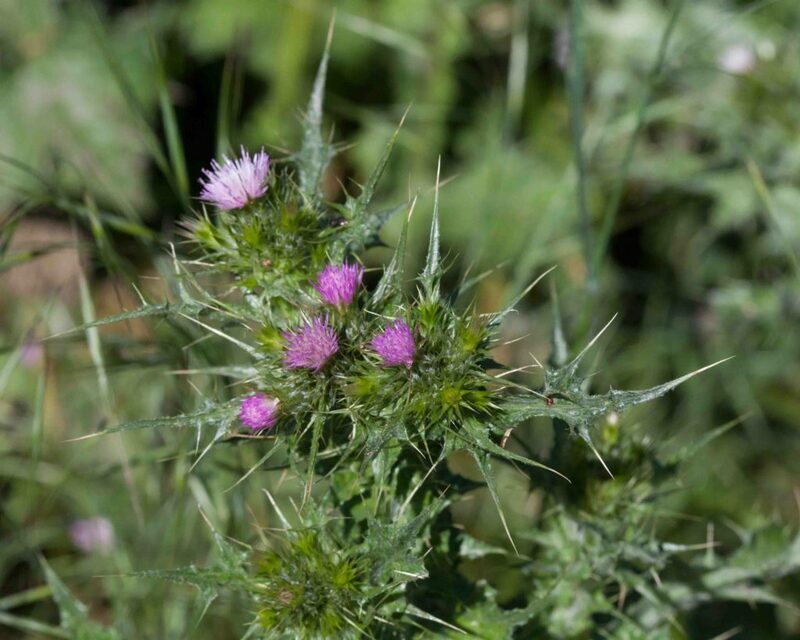 Although this shares the same genus with the noxious and invasive Star Thistles, it could hardly look more different, bearing a much closer resemblance to the Knapweeds which are so common in the plant’s native Europe. 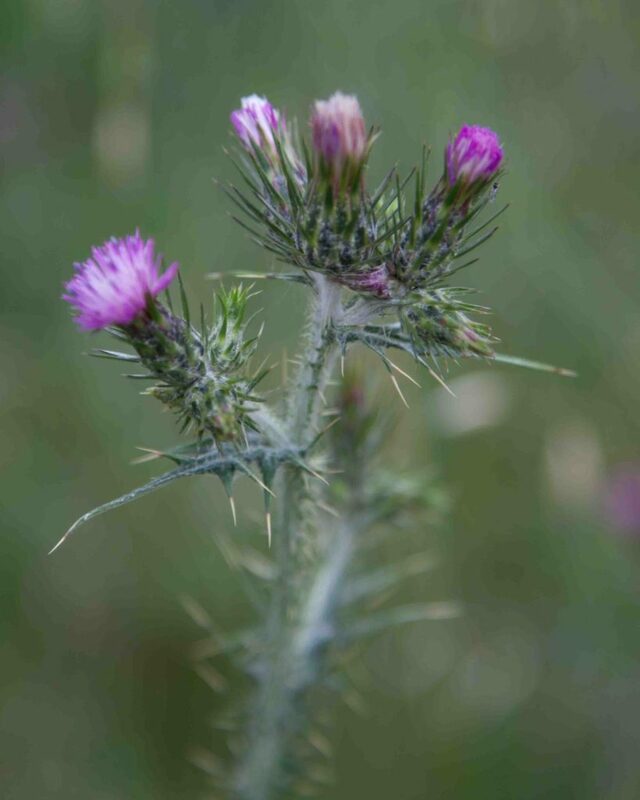 One of three invasive Star Thistles, this has pink-purple flowers borne on a head with long, sharp-spined phyllaries, 6–25 mm long. 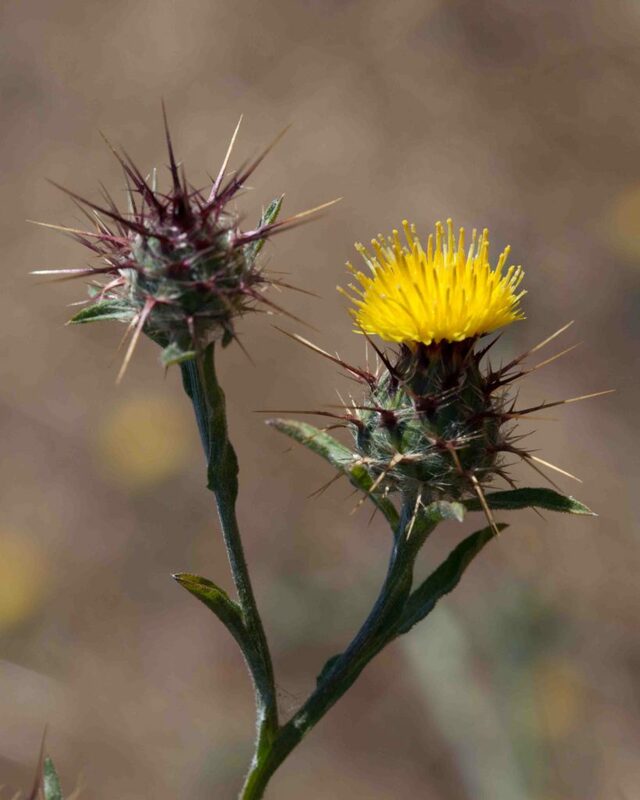 One of three, and the most invasive, of the Star Thistles, this has yellow flowers borne on a head with long, sharp-spined phyllaries, 10–20 mm long. 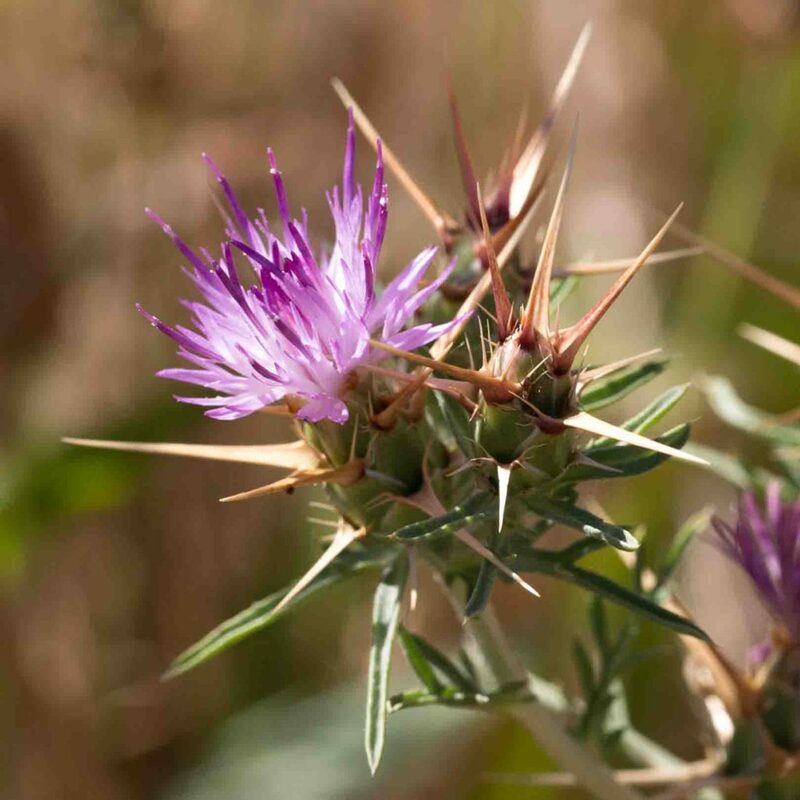 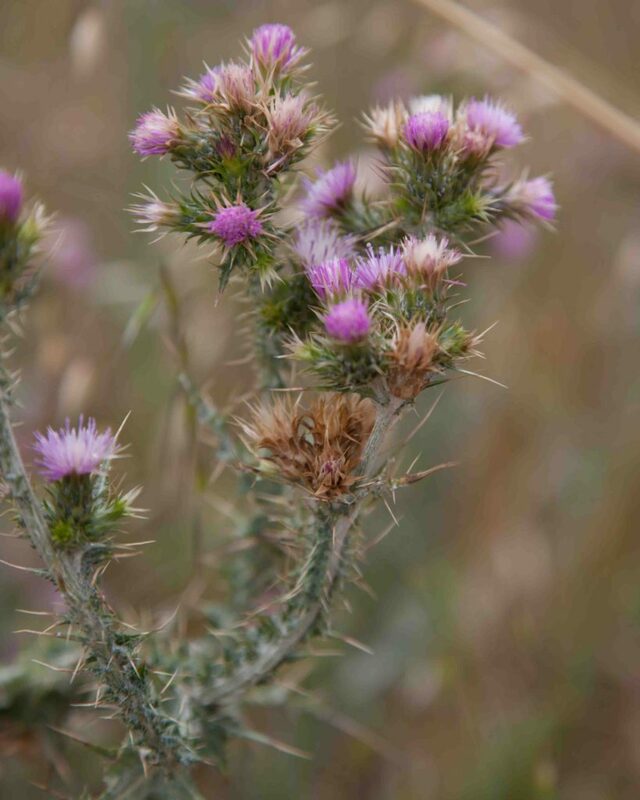 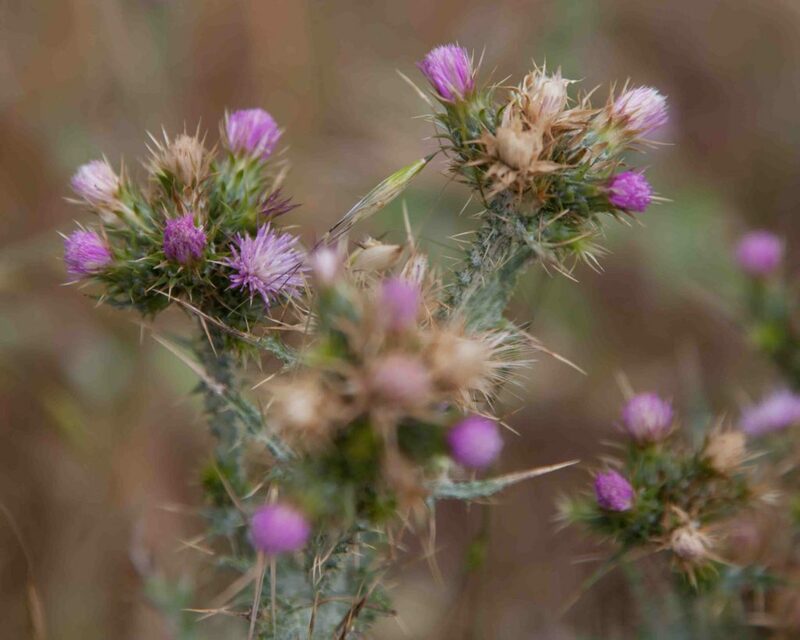 One of three invasive Star Thistles, this has yellow flowers borne on a head with dark purple, sharp-spined phyllaries, 5–10 mm long, rather shorter than those of the Purple and Yellow Star Thistles (Centaurea calcitrapa & solstitialis). 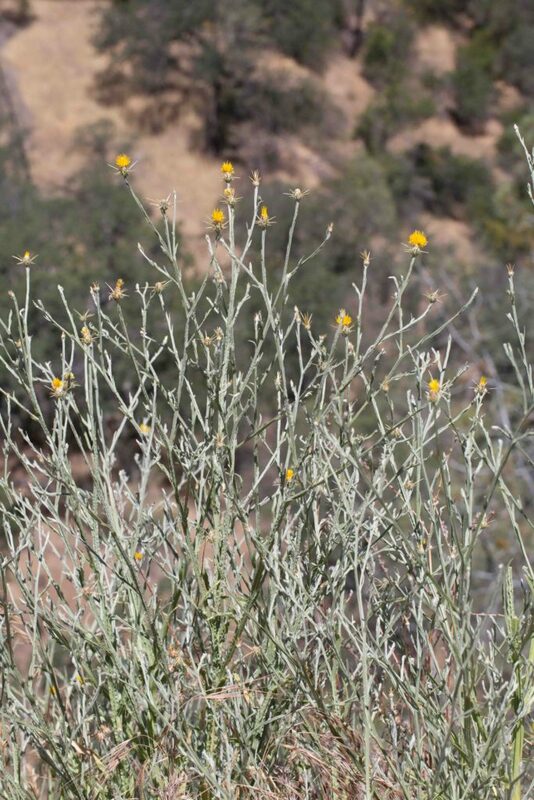 Leaves are short, soft and narrow, grayish-green in color. 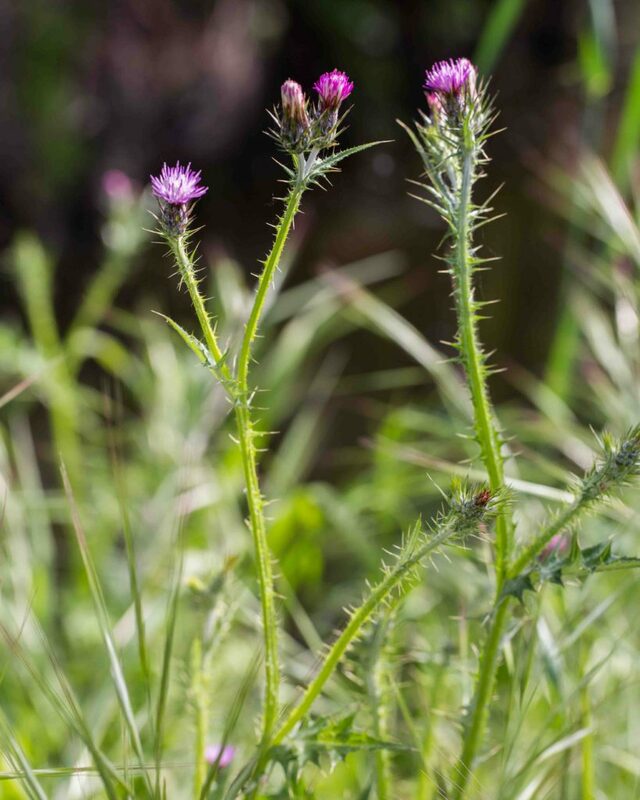 The large pinkish-purple flowers are subtended by star-like phyllaries with long, sharp spines radiating out from the base of the flower head and are immediately recognizable. 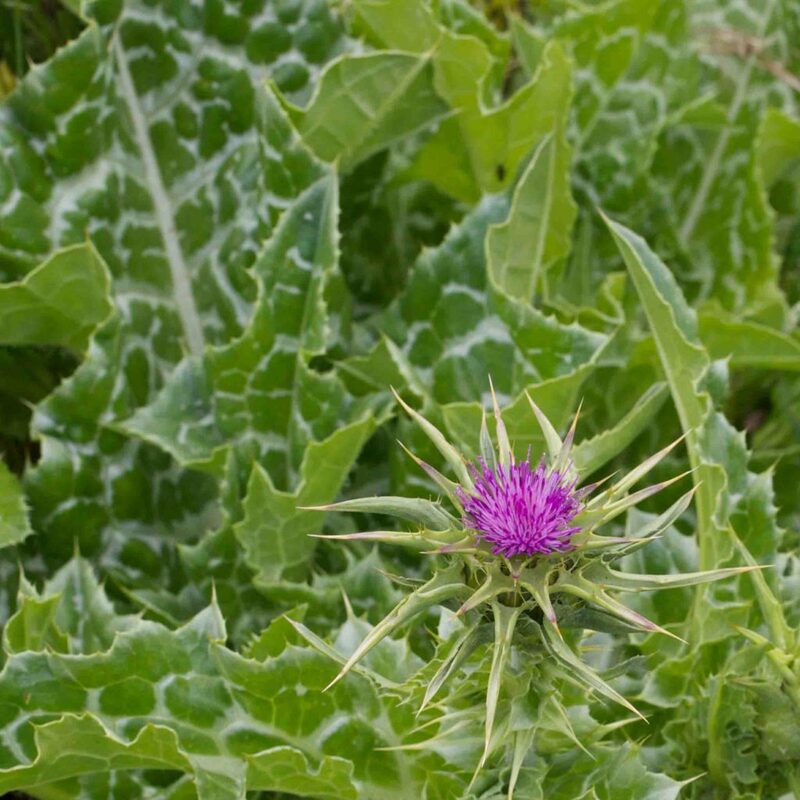 Equally distinctive are the large, white-veined leaves. 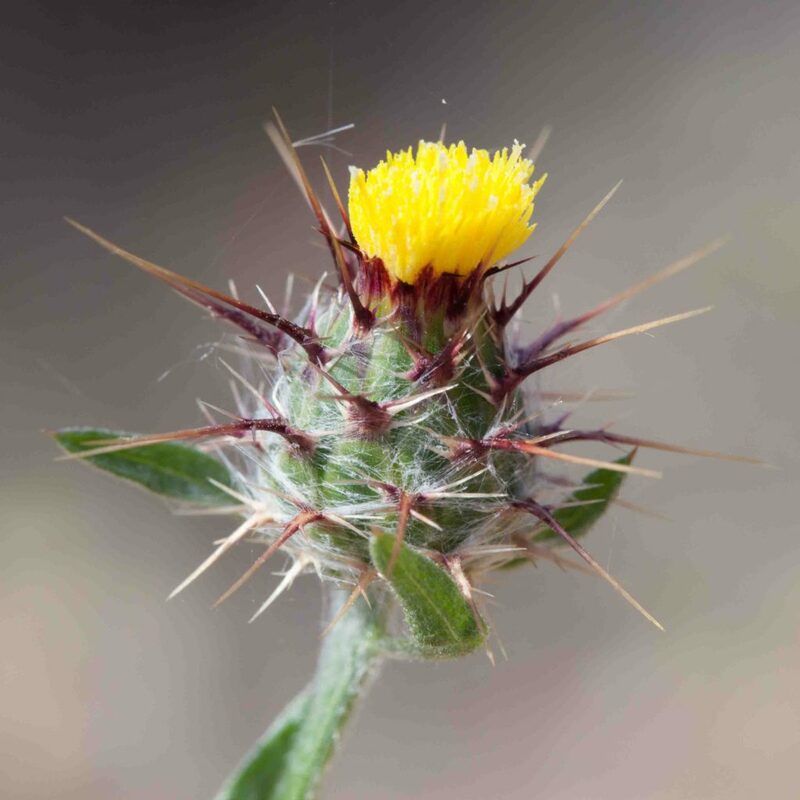 Although in the “limited” category of invasiveness, it can be highly invasive locally and take over extensive areas.